Defender John Dempster is one of the success stories of the Diamonds Youth policy, earning a contract on 1 July 2001. He graduated to the first team during the first season in the Football League, and established a regular place in the side at the start of the following season – scoring a memorable debut goal at Bournemouth. His dismissal in the League Cup defeat at Coventry was the precursor to a period where he struggled to adjust to League Football and his opportunities for the remainder of the season were limited. With the club in Division 2 for season 2003-04 Dempster was still capable of earning his place in a side at that level until the start of 2004, after which most of his appearances were from the bench. Following Brian Talbot’s departure, Ernie Tippett decided to use John in midfield following the team’s relegation to League 2, but Barry Hunter quickly restored him to a defensive role following Tippett’s departure. He started the 2005-06 season as a regular in defence, but was sold to Oxford United on 12 January 2006, in a deal which included Andy Burgess. 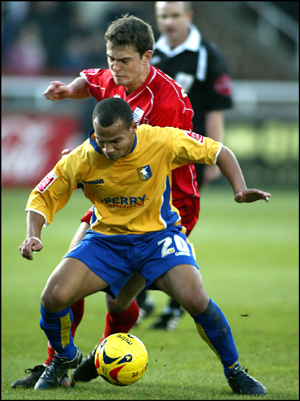 His stay at the Kassam Stadium lasted one year, and on 1 February 2007, he moved to Kettering Town. He captained the side to the Conference North title in 2008, but after 177 appearances and 22 goals in four years with the Poppies, John signed for fellow Conference side Crawley Town for an undisclosed fee on 6 January 2011. After their promotion to the Football League, John failed to gain a regular place, and went on a one month loan to Kettering Town on 22 September 2011, making a further 5 appearances before being sent off in his last game for them on 18 October. After his return to Crawley, he went on a three month loan deal to Mansfield Town on 22 November 2011 during which he scored 3 times in 12 appearances, before returning to the Red Devils. He made four more appearances for Crawley at the end of the season, scoring twice in a total of 20 games.in all before leaving in the summer. On 14 July 2012, John signed a contract to join Conference side Mansfield Town. After making a further three appearances for the Stags, he went on an emergency one month loan deal to Tamworth on 8 September 2012, before returning to the Stags. After retiring from the playing side of the game in summer 2015 he became the Mansfield Town Academy Manager.